Alternative urban spaces across civic, private, and public spheres emerge in response to the great challenges that urban actors are currently confronted with. Labour markets are changing rapidly, the availability of affordable housing is under intensifying pressure, and public spaces have become battlegrounds of urban politics. This edited collection brings together contributors in order to spark an international dialogue about the production of alternative urban spaces through a threefold exploration of alternative spaces of work, dwelling, and public life. Seeking out and examining existing alternative urban spaces, the authors identify the elements that provide opportunities to create radically different futures for the world’s urban spaces. This volume is the culmination of an international search for alternative practices to dominant modes of capitalist urbanisation, bringing together interdisciplinary, empirically grounded chapters from hot spots in disparate cities around the world. Offering a multidisciplinary perspective, The Production of Alternative Urban Spaces will be of great interest to academics working across the fields of urban sociology, human geography, anthropology, political science, and urban planning. It will also be indispensable to any postgraduate students engaged in urban and regional studies. Many cities across the globe have experienced interrelated processes of fundamental economic social, political, demographic, and cultural changes. With the rise of neoliberalism as the dominant paradigm in the closing decades of the twentieth century, notably cities have witnessed a significant extension of the realm of allocation through markets. This development has, among many other things, brought the issue of urban spaces, which are – at least temporarily - outside these market arrangements to the fore. This volume presents an in-depth look at such "alternative urban spaces" from a cross-disciplinary perspective. It clearly shows the many forms and trajectories alternative urban spaces can present as shown by, for instance, makerspaces in Milan and refugee spaces in Cairo as well as by how music has helped to reclaim public spaces in Belo Horizonte. It also demonstrates multiple ways of comprehending these different forms of alternative urban spaces. In a more literal sense, this volume also covers a lot of ground geographically: from Berlin to Beirut, from Milan to Istanbul, and from Accra to Chandigarh. This volume, then, offers a welcome and timely panorama of how urban actors try and often succeed in creating and maintaining alternative urban spaces. Thus, it contributes to our understanding of contemporary urban politics. This intellectually engaging and empirically grounded book interrogates the political and scholarly significance of alternative urban spaces in today’s globalized world. At a time in which technology-intensive capitalism is increasingly seen and experienced as a totality pervading almost any aspect of social life potentially in every corner of the world, this book challenges the commonly held idea within critical urban studies that today’s global urbanization of the planet erases the very possibility of an alternative outside. On the contrary, the editors of the collection suggest that there are multiple ‘constitutive outsides’ within existing trajectories of urban development. Some of these constitutive outsides have the potential to uncover alternative urban futures, as they contain the seeds of radical societal change. 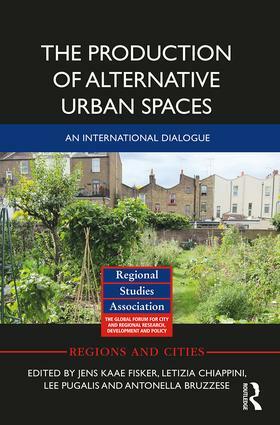 The empirical chapters of the book offer evidence to this argument by exploring different kinds of alternative urban spaces (of work, exchange, and consumption; of dwelling; of public life) in a tremendous variety of geographical contexts in both the South and the North of the globe, particularly in Western Europe, the Middle East, Latin America, sub-Saharan Africa, South Asia. For both its conceptual insights and empirical explorations, this book is highly recommended to urban scholars, practitioners and activists committed to a critical and transformative understanding of contemporary urban worlds. Jens Kaae Fisker is a postdoctoral researcher in the Danish Centre for Rural Research at the University of Southern Denmark. Working at the intersection of rural and urban studies, his research is rooted in political geography with a particular emphasis on the spatial dimensions of contentious politics and the material and political pursuit of post-capitalist futures. Letizia Chiappini is a PhD candidate in urban studies at the University of Milano-Bicocca and in the Geographies of Globalization group at the University of Amsterdam. Her research interests revolve around urban transformations and the generation of societal change under late capitalism. In particular, she attends to the relations between urban policy making and hyped phenomena such as the sharing economy and the maker movement. Lee Pugalis is chair of urban studies at the Institute for Public Policy and Governance, University of Technology Sydney, and a visiting professor at Leeds Beckett University. He is an international urban scholar, whose research traverses local and regional economic development, urban regeneration, and strategic planning. He has a particular interest in metropolitan governance and urban entrepreneurship. Antonella Bruzzese is Associate Professor at the Politecnico di Milano in the Department of Architecture and Urban Studies. Her research interests cover urban design and urban transformation strategies. She is particularly interested in the spatial implications of urban policies and their relationships with participatory processes, communication strategies, and temporary interventions.